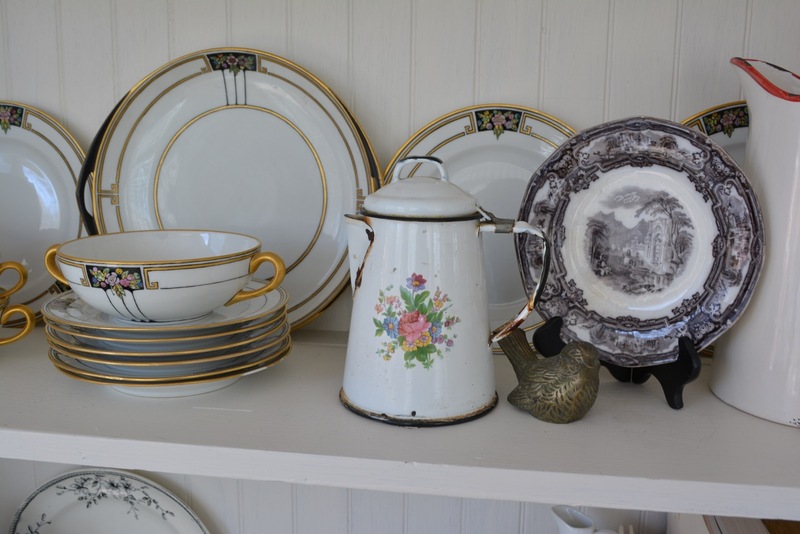 The dish dresser in the sunroom got a late winter overhaul. All the plaid and the sparkly and snowy branches have been removed. 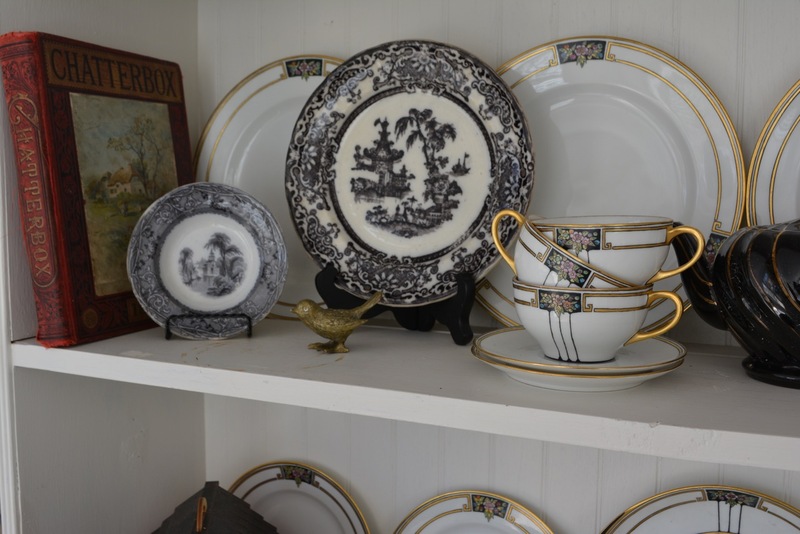 Bill's grandmother's china looked so gorgeous over Christmas that it needed to stay. 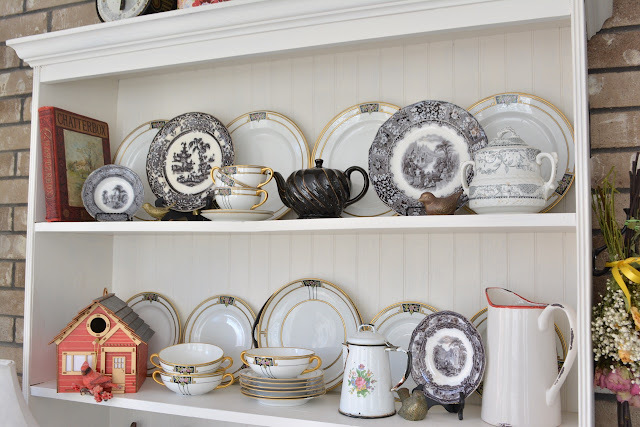 Once all the plaid was removed, there was room to dot a few pieces of our black transferware into the mix. The red had to be a prominent feature because of the cute bird house that my son got me for Christmas. 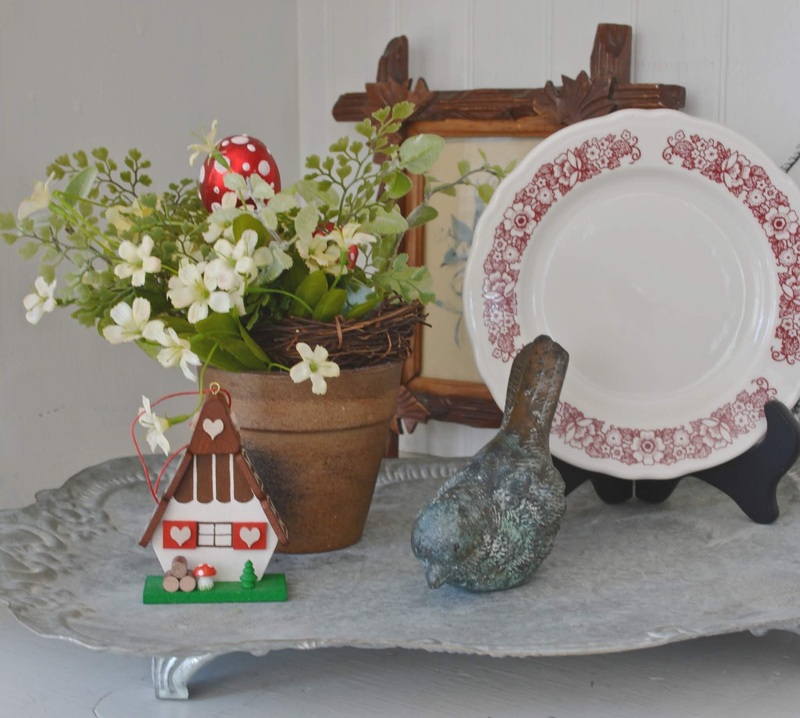 It's so well made that I can't bear to put it outside in the weather and the garden room is the perfect place for it. Black and red is such a classic combination. We have some little brass birds. I tucked them in and around the dishes. 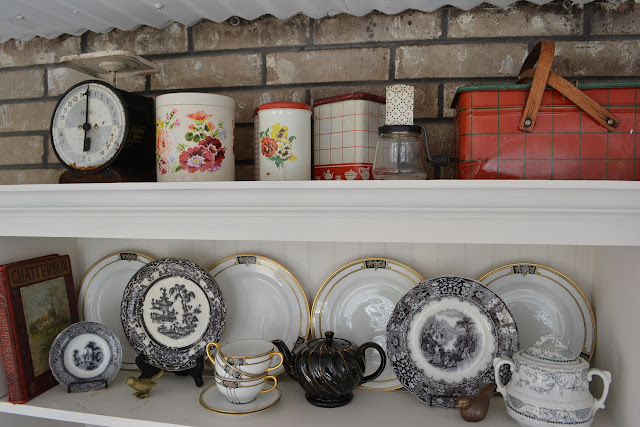 A few tins with red are displayed on the top of the hutch. My favorite little spring plant has a few glass mushrooms clipped onto the stems. The little chalet ornament came from Epcot. 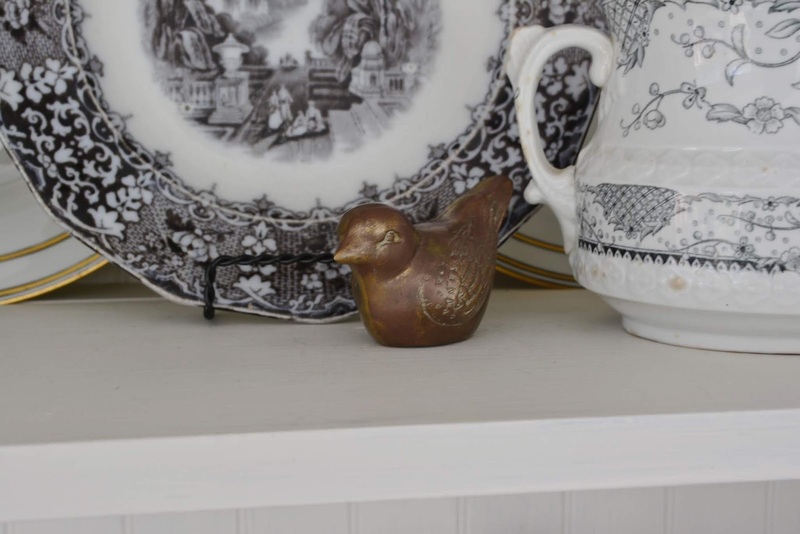 All the birds were thrifted for a dollar or two. 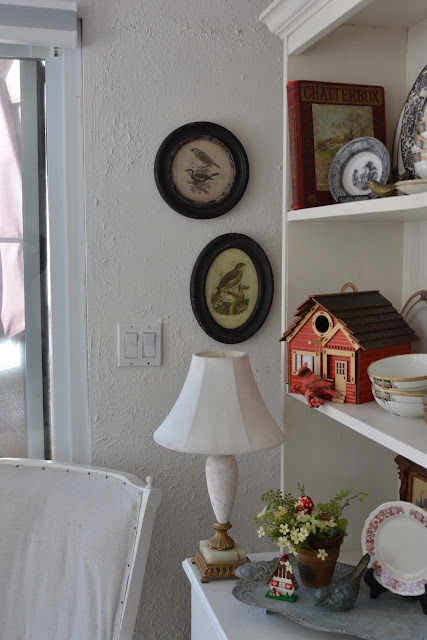 Some bird prints from the Raz Imports Warehouse Sale hang on the wall. They are actually hung on existing nails. I'm really not sure if they need to be offset but the outlet is there so I left it. I'll probably fix it tomorrow. 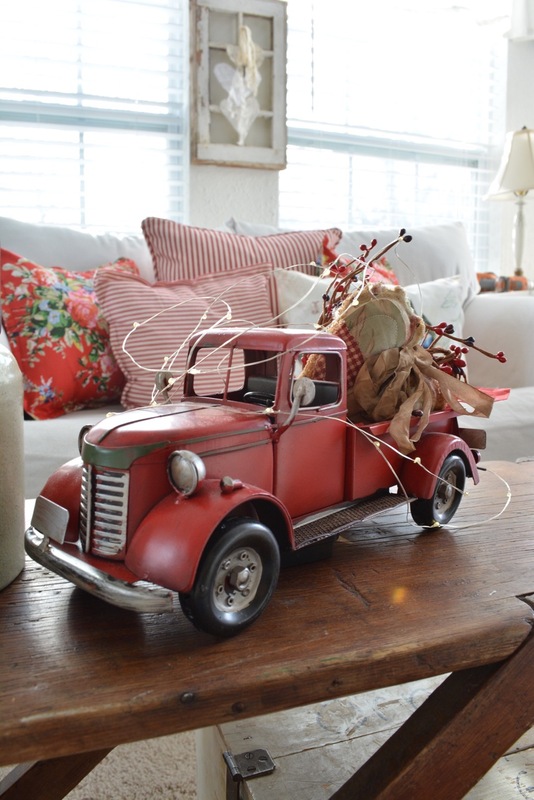 The other red inspiration piece in the room is the little red truck from Hobby Lobby. This thing is just too cute. I've had fun decorating it for the seasons and holidays. Hobby Lobby has a new red truck as part of their spring line but it's bigger and more rustic. Pick ups are still trending in design so I'd run out and grab one if I were you. The pick up is adorable with hearts and it will be cute with flowers and garden tools. I think I have some mini garden tools around here somewhere. 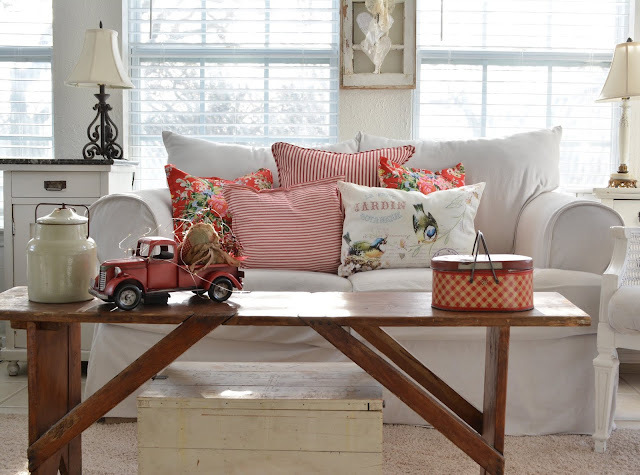 The bird pillow on the sofa came from the thrift store for $8.00. It got a good hot washing and drying. A must for thrifted fabric. That is it for now. 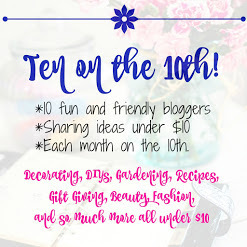 Be sure to come back on Sunday for Ten on the 10th. 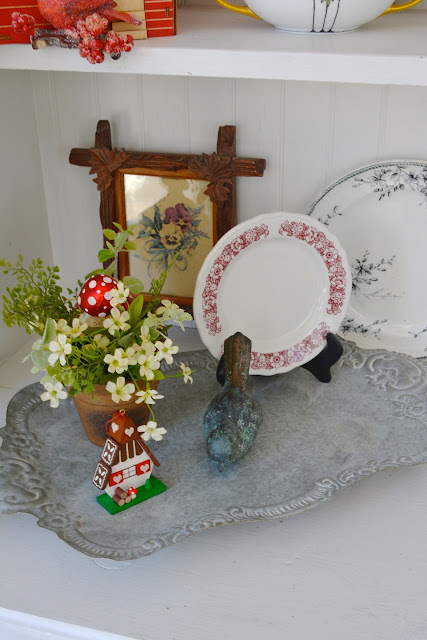 We are having a thrift store challenge and link party. I can't wait. 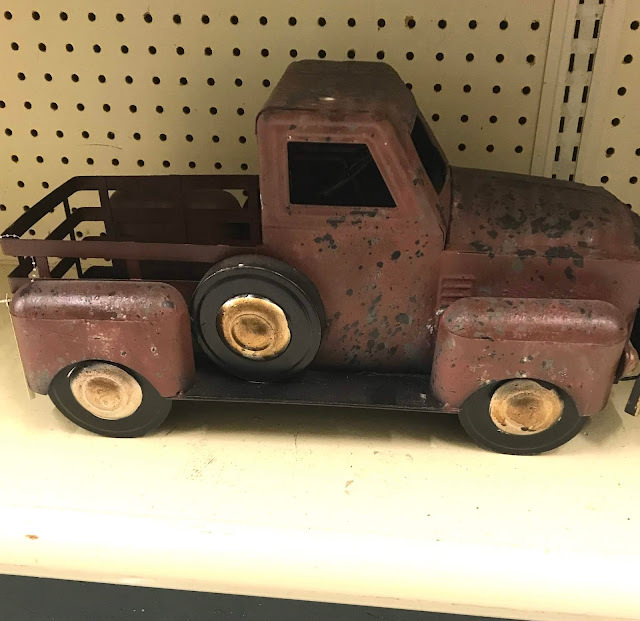 I have another thrifted truck to show you. It's been transformed from its original purpose and it's so cute. It's so cold today that I think I'm staying in. 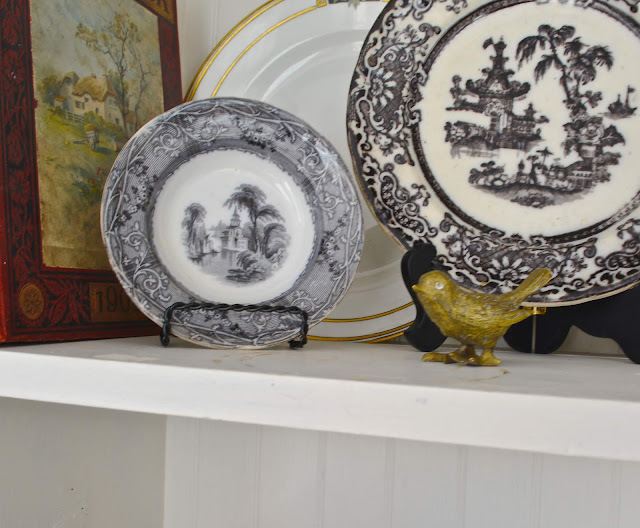 Your black & white transferware is stunning. 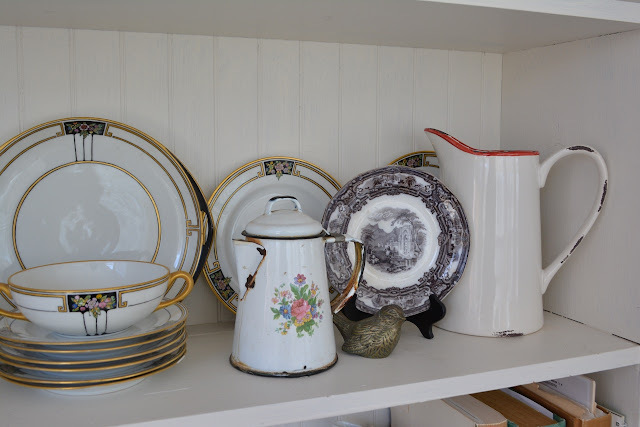 . .
especially with your china and the red & white accents! I saw a moss covered truck on one of my sites from Ozark, MO. today. I LOVE your red truck! 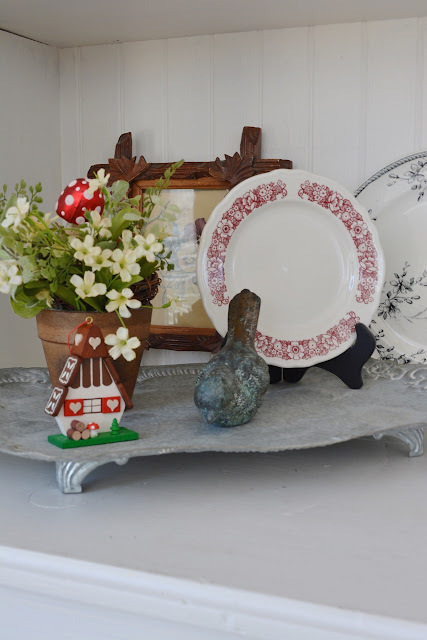 I adore RAZ Imports and floral! 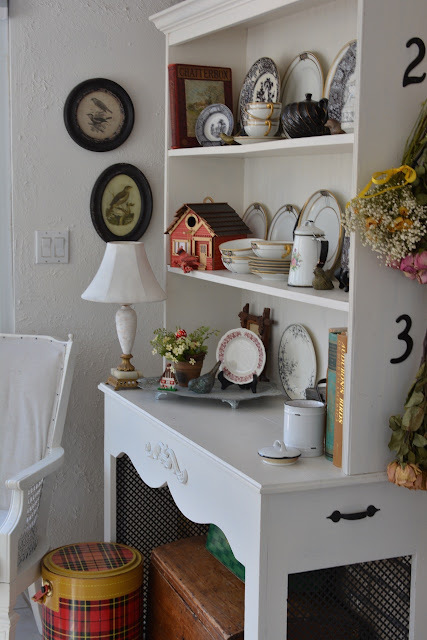 This cabinet is filled to the brim with inspiring detail! 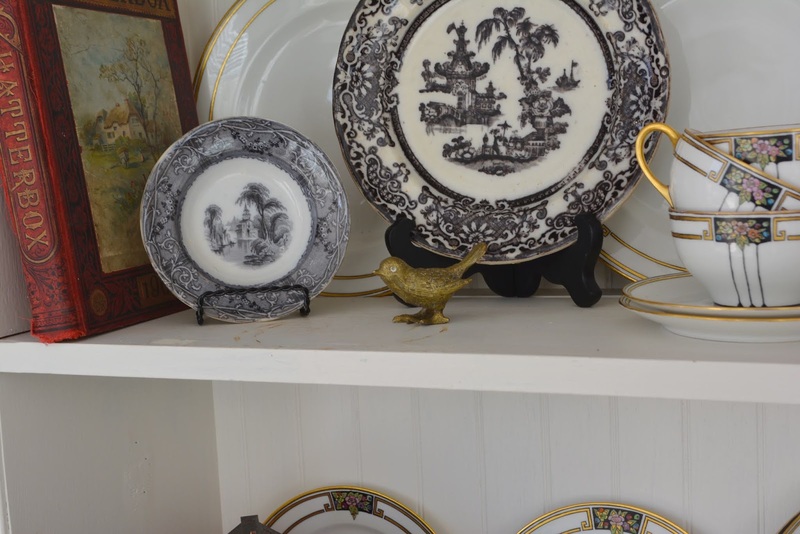 Katie, your china and the black transferware is perfect together. 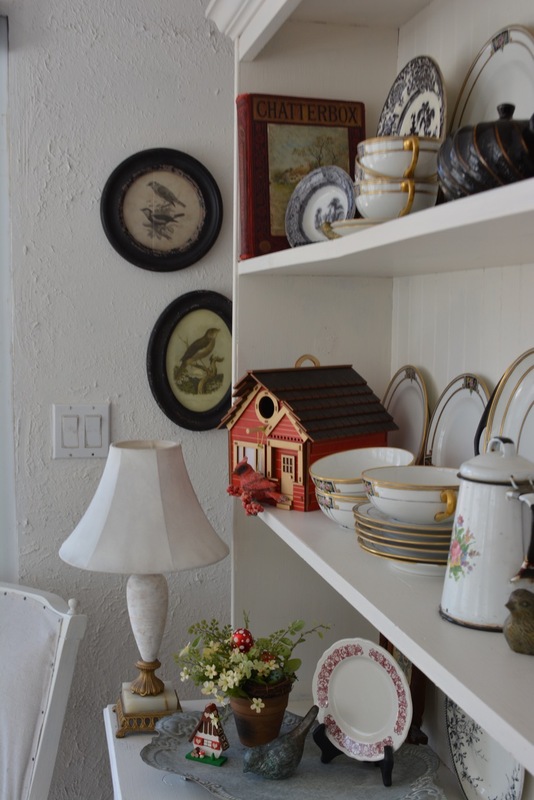 Isn't it fun to restyle the shelves? I think it helps me see things again. It is cold here too! We even had sleet today. Have a great weekend! Love the little truck! 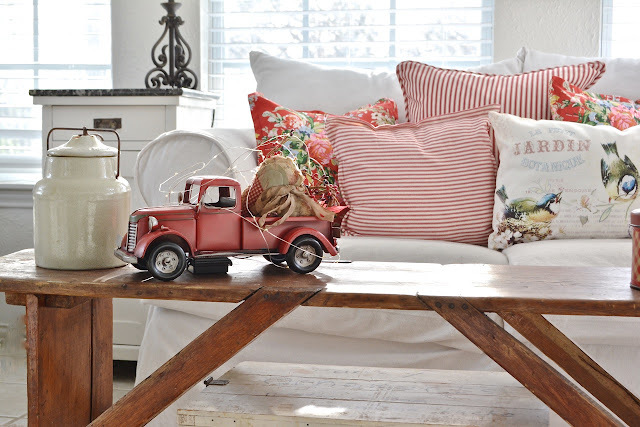 So versatile for decorating. 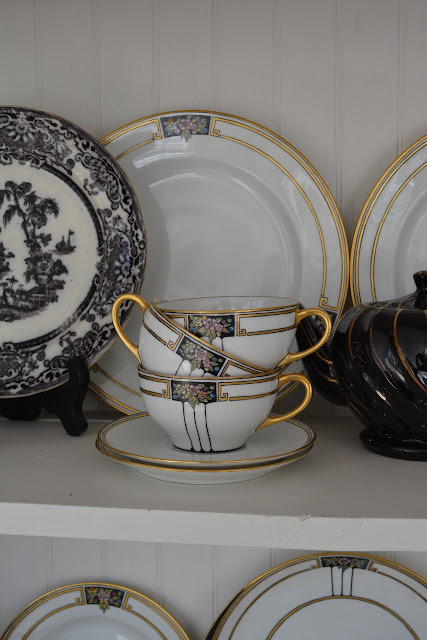 I don't see a lot of black transferware so this is particularly striking and lovely with the china. Getting time to change up my cabinet too -- this is a good reminder! Looking forward to seeing your post here on Sunday. Love your husband's grandmother's china... 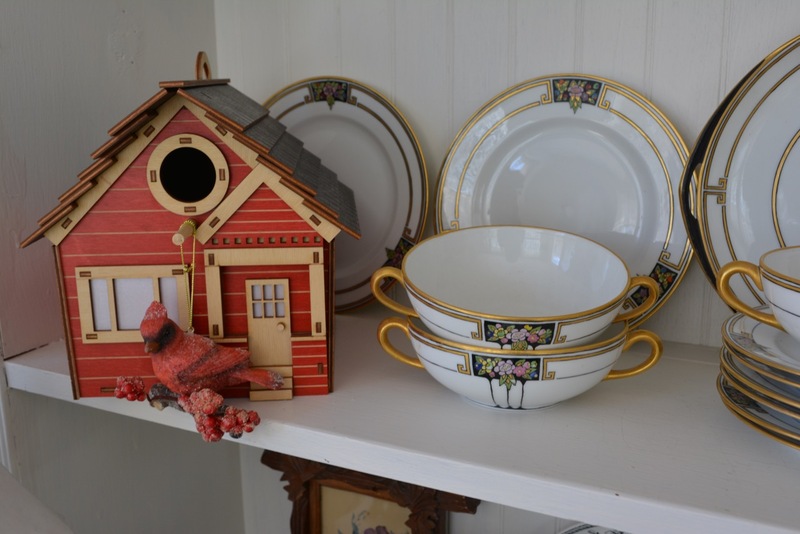 I am ever so grateful for the few pieces I have from my two grandmothers: one cut-glass bowl and a few hand-crocheted doilies. Favorite gifts, indeed! 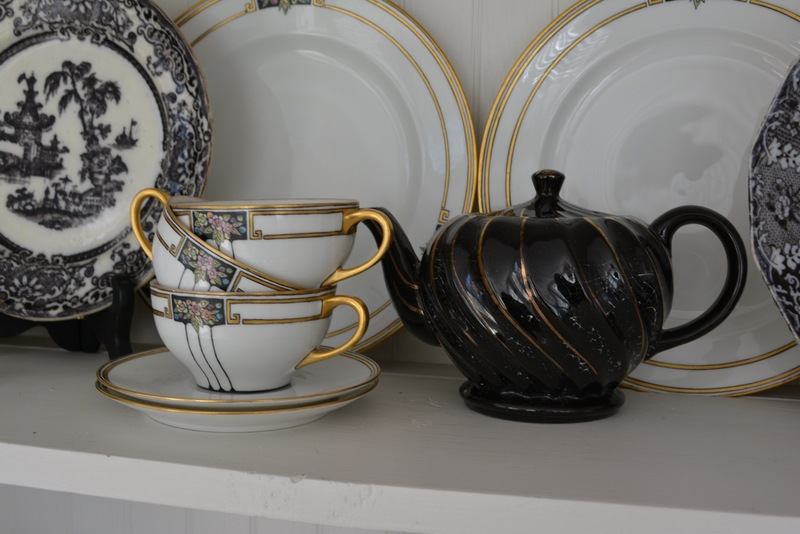 I Love your black transferware china, also the black and gold teapot is so gorgeous. They should always be on display. I'm your newest follower. Thelma.